Non-Toxic Munchkin: NTM NEWS BRIEF: Cambell goes BPA free! After two major studies brought the dangers of BPA in canned food to the eye of the mainstream media late last year, Cambell’s Soup brand has decided to phase out BPA from their canned foods! 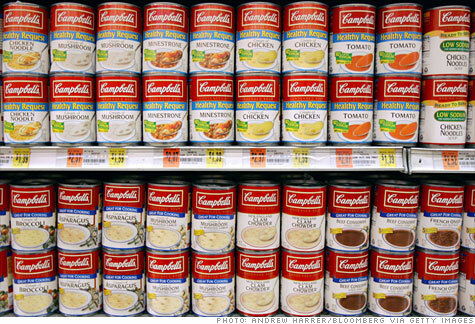 The first study, conducted by the Breast Cancer Fund, found that Cambell’s soup cans had some of the highest levels of BPA when compared to other canned food. Even worse, it found that the brand’s canned food marketed towards young children (specifically soups and Spaghetti O’s with fun shapes) ranked highest - had the highest levels of BPA- in the study. In October, a month after the Breast Cancer Fund study, the Harvard School of Public Health published a study linking BPA exposure during pregnancy to hyperactive, depressive and anxious behavior in young girl toddlers; the higher the BPA levels in the mother during pregnancy, the more likely the girls were to exhibit these traits as toddlers. The US Food and Drug administration announced earlier this year that they plan on reevaluating the safety of BPA in food packaging and have said they will have a decision my the end of March. In Europe, French lawmakers have passed a law banning BPA from ALL PACKAGED FOODS, and EU-wide legislations is suspected to follow... all of this also following another study that gained a lot of media attention where Consumer Reports (in the US) found that “Consumers eating just one serving of canned vegetable soup (they tested) would get about double what the FDA now considers typical (and safe) average dietary daily exposure. The sad reality is that in seeking “alternatives to BPA” they might be using new chemicals that in a couple of years prove to be just as bad as BPA (the company has not specifies what alternative chemical they will be using) however, this is a major win for non-toxic proponents. Favoring fresh foods or foods that come packaged in glass for our munchkins and ourselves should remain everyone’s priority, but having BPA free canned foods available for use on mainstream supermarkets across the nation is a great step forward. BPA is an endocrine disrupting drug that is found in the linings of metal food cans (also in plastics and store receipts). It has been linked in lab studies to breast and prostate cancer, infertility, early puberty in girls, type-2 diabetes, obesity and attention deficit hyperactivity disorder. Childhood exposure is of concern because this endocrine-disrupting chemical can affect children’s hormonal systems during development and set the stage for later-life diseases. Every single person in the planet has traces of BPA in their bodies.